I love wit! When someone says something so apropos to the situation that just cuts through expectations and right into the heart of the matter often with a humorous twist….my 3rd son does this with an amazing regularity….Thanks Jeri for urging us to stop to think for a minute! Yes wit, it’s gorgy! (I kind of wrote about it under the letter J back awhile ago). But those with that kind of gift, it’s an amazing talent! As a writer, artist and former dancer, I find all of those that express themselves through the arts, be it dance, theatre, singing, writing, visual art and more, to be very beautiful. How blessed you are to have such a beautiful family. Talent absolutely needs to be cultivated and worked at. So tenacity is hugely relevant – there are people who don’t realize how much hard work goes into developing talents. Nice point! This is an excellent post, the kind of person wants to come back and read again. I’m so glad I found your blog. I am so glad to subscribed to this feed. I’m looking forward to more posts. 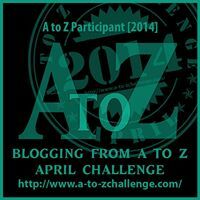 This is my first year in the A-Z, and I can’t believe how many interesting people I’ve met and blogs I’ve read. What a worthwhile experience it’s been. I also love your take on unique, and thank God for wit! Thanks for your support! And it’s my first A to Z as well. Such a nice community building thing! I’m learning a lot too! Will be visiting you back Deb!